The Flash: What is the Crisis? Warning: Major Spoilers ahead for tonight's episode of The Flash. At the end of tonight's episode of The CW's The Flash, the audience learned that there is much more to the seemingly-benevolent Harrison Wells than meets the eye. The founder of S.T.A.R. Labs might not have outed himself as a bad guy, necessarily -- but certainly as a time-traveler. More on that in another story, but the key thing is that the newspaper he had onscreen came from the future, and it featured a lot of interesting material. Yes, this paper indicates that Batman (or at least Bruce Wayne) exists in the Arrowverse. Here, we see a headline that Wayne Enterprises and Queen Consolidated are merging. Interestingly enough, The Flash showrunner Andrew Kreisberg took over as writer on Green Arrow last week, and one of the things he did was have both Bruce Wayne and Lex Luthor make a move on Oliver Queen's charitable foundation. They hoped to merge with him, nursing his corporation back to health and putting his foundation and his liqiuid assets to good use in the process. At any rate, that's a thing. Don't expect Batman right away -- possibly ever -- especially with Gotham happening over at Fox, but Bruce Wayne exists here. Above the fold, we see a shot of The Flash, in what is more recognizable as the "final" comic book version of his costume. It says that he's still missing following a crisis, and a smaller headline on the right indicates that "red skies" have vanished. 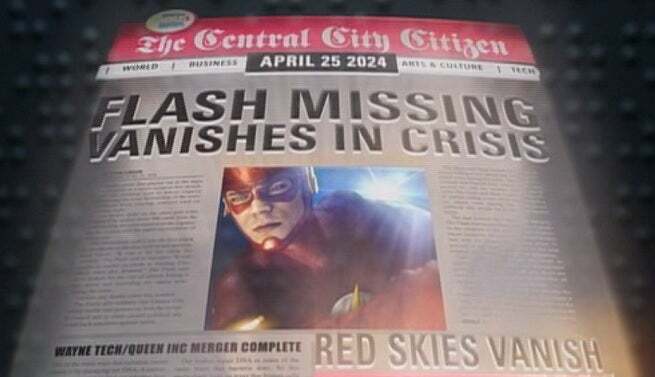 This is a pretty overt reference to 1985's Crisis on Infinite Earths, in which Barry Allen sacrificed his life to save the DC Universe from a massive antimatter cannon fired at the core of the matter universe by the Anti-Monitor. He remained dead for 20 years -- nearly an unthinkable amount of time, considering it's comics -- before returning in Final Crisis, the fourth Crisis event in DC's publishing history and (so far) the last. A new Crisis is expected along soon and may, in fact, be announced at New York Comic Con this week. But what was the Crisis? In the DC Universe, at the beginning of time, there were two cosmic entities -- the Monitor and the Anti-Monitor. The Monitor was benevolent and benign, and oversaw the universe of matter. The Anti-Monitor was aggressive and evil, and his domain was the Ant-Matter Universe. At one point, a brilliant scientist on the planet Maltus tried to use a machine to peer back through time to see what created the universe. He failed, but the resultant explosion sent ripples through time, fracturing the matter universe and creating an infinite number of possible universes. The problem was that in so doing, he made each matter universe weaker than the one Anti-Matter Universe...a weakness the Anti-Monitor sought to exploit, destroying thousands of universes and killing trillions before the Monitor even knew what he was up to. Ultimately, the Monitor would gather a team of champions from around the DC Multiverse to help him secure the multiverse, but the Anti-Monitor was so powerful that he and his forces still managed to do a massive amount of damage. 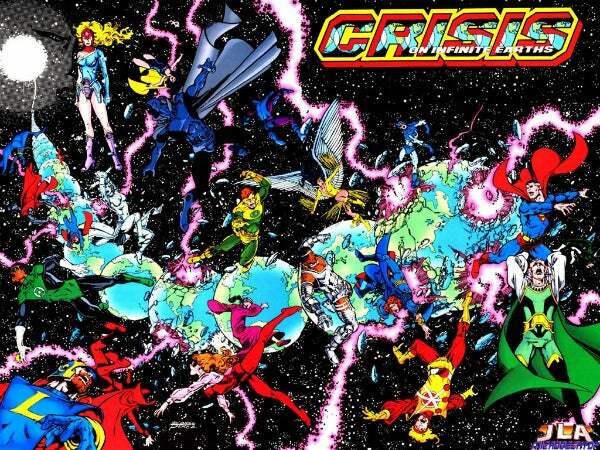 Ultimately, in order to save life itself, the infinite possibilities of the multiverse had to be folded into one world, where all DC stories took place until the events of Infinite Crisis restored a limited version of the Multiverse with 52 worlds 20 years later. It's that multiverse that continues to today, albeit in a modified form since the New 52 relaunch. The Anti-Monitor has shown back up again very rarely since then; he appeared in a storyline called "Chain Lightning" during the Mark Waid run on The Flash, in which Wally West had to gather an army of speedsters from throughout time to battle the Anti-Monitor in a version of the universe where Barry hadn't stopped the anti-matter cannon and the Anti-Monitor had successfully eradicated nearly all life in the universe during Crisis. He popped up again during The Sinestro Corps War, and then was killed a second time, but his containment armor became a weapon (and very telling fashion choice) for Superboy Prime when he cracked and turned against the universe in Infinite Crisis, the second (but first "official") sequel to Crisis. That storyline, by the way, was written by Geoff Johns, DC Entertainment's Chief Creative Officer and one of the credited writers on tonight's episode of The Flash. Johns also wrote The Sinestro Corps War...so we're starting to see a pattern emerge...!